A small but attentive group gathered in the beautiful bostan (garden) behind the Belgrade Church in Yedikule (above) last Sunday (September 1) to hear a talk on 16th-century remedies for ailing plants by Aleksandar Shopov – the PhD candidate at Harvard University who has spent the last month or so in Istanbul fervently trying to save from destruction the 1,600-year old bostans surrounding the land walls of the Old City. Shopov is one of the founders of the Yedikule Bostanları group, dedicated to disseminating information about the historical significance of the bostans and their importance to the local community. 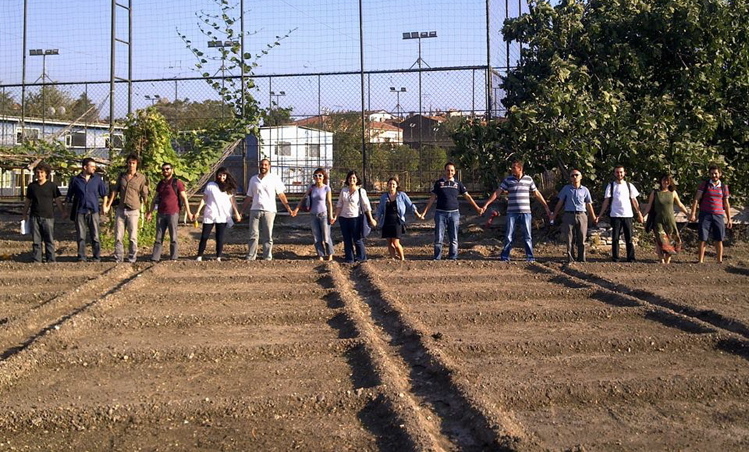 Last month they invited Dr Chantel White, an American archaeobotanist, to do an assessment of the land around Yedikule and write a research report that can be used to lobby the relevant groups. Chantel also conducted an engaging and informative workshop to mark the formation of the School of Historical Yedikule Gardens, which also organised Sunday’s event (click here and here to read more about Chantel's workshop). The Revnak-i Bostan has been an object of fascination for Aleks for a while. 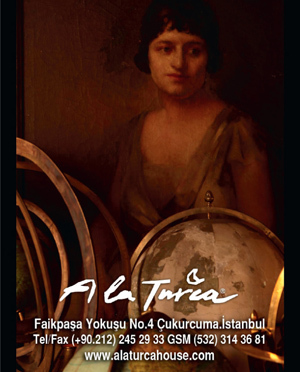 In a presentation at Boğaziçi University two years ago he discussed the origins, structure and significance of the book. 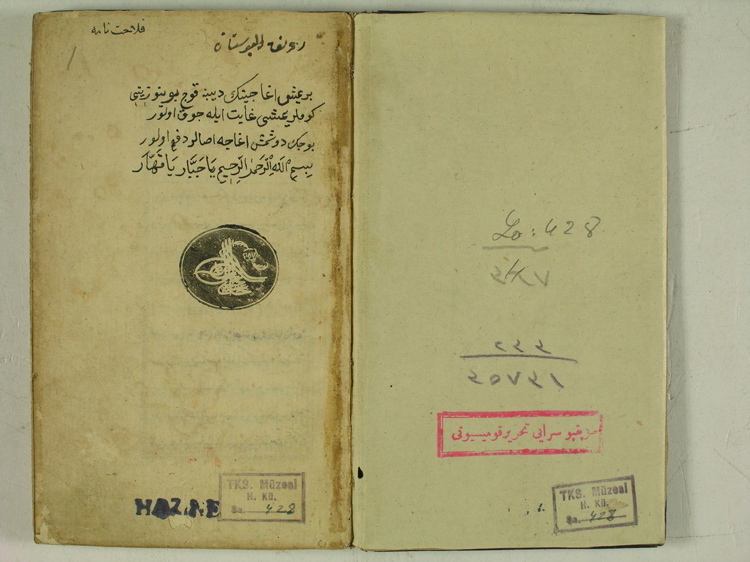 ‘From the introduction we learn that the anonymous author decided to create such a book on the science of farming following his involvement in the restoration (ta'mir) of a garden (ravza-i cenet-i bahçet) in the vicinity of Edirne (Edrene-i mahmiyye),’ Aleks told his listeners. 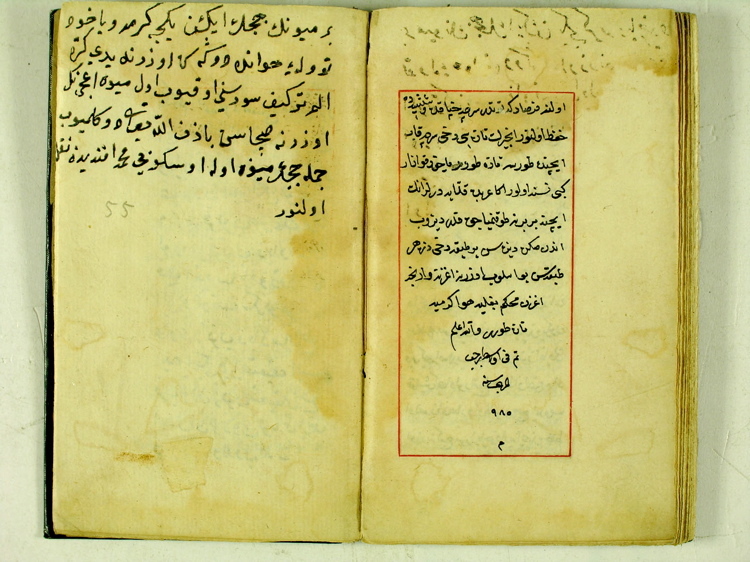 Revnak-i Bostan’s author apparently incorporated the ‘opinions of the wise man’ (akval-i hukemaya itiba) from farming books (kutub-i felaha) and from his own experiences in the garden. The first section of the book covers categories of soil; the second the planting of fruit trees; the third pruning and grafting, and the fourth pests and remedies. There is also an addendum about bostans and flowers in general, with special emphasis on the cultivation of melons and watermelons. Aleks also offered some insights into why farmers and others of that era were becoming increasingly interested in the creation of ‘written horticultural knowledge’. One such reason is attributed to the ‘repetitive cycle of establishing highly profitable market gardens and their frequent destruction’. In this sense, the ‘Revnak-i Bostan may have been the fruit of very favourable climatic conditions for agriculture in the region of Edirne on one hand, and the periodical devastation inflicted by the rising waters on the other,’ Aleks says. In Sunday’s workshop Aleks brought the Revnak-i Bostan directly to his audience and read from its pages to answer such questions as: ‘Why do fruit trees get sick?’, ‘How can we tell if a tree is getting sick?’ and ‘How do we identify the disease?’ The main part of his presentation, however, centred on ‘Remedies for ailing plants’. There are a number of ways to establish whether a tree is sick. Leaves are a good indicator of health. If the leaves of one tree fall before every other tree, it can be concluded that the tree is sick. If the green of the leaves is fıstıkı rengi – that is, the pale green of pistachios rather than a bold green – the tree is sick. To identify the disease of the tree, the Revnak-i Bostan provides us with a long list of suggestions: if leaves have spots on them (benek benek alaca), worms or maggots have attacked the tree; if the leaves appear scorched (kavruk gibi imuş) and shrink, there is a good chance that the tree’s root has encountered a stone or a hidden hard surface; if the leaves are greyish (boz olup) and dry, the tree needs water. To identify the disease, it is recommended that the roots are cut open and examined closely. As Aleks begins describing the various remedies for sick trees as detailed in the Revnak-i Bostan, the first thing he tells us is that the majority involve the use of different types of manure and/or human urine. For example, burning the stones (çekirdek) of almonds (badem) or apricots (kayısı) and mixing the ashes with manure (half-and-half) can cure soft-fruit trees such as fig (incir) and pear (armut). For hard-fruit trees, rather than apply the mixture directly to the tree itself, dig into the root and sprinkle the mixture and water there. Dog faeces mixed with human urine (or the urine of any four-footed animal) can cure trees attacked by worms. Another method for getting rid of maggots and worms is to apply ox manure (sığır ödini) to the tree. According to Kastos Hakim in Geoponika – another discovery of Aleks's, a 10th-century document detailing the gardening calendar for Istanbul – digging a trench around the tree the size of one or two spans of the trunk and pouring in human urine is also an acknowledged remedy. There are, however, Aleks assures us, treatments that can be implemented without using manure or urine. For a guava (amrud) or pear tree that is drying out, expose the roots, take out the soil and apply pebbles, together with soil from the surface. Then pour in water, re-cover the roots and watch the tree get better. Applying nut grass (somun çim) or buckthorn seeds (topalak otu), both invasive weeds, chopped and mixed with water was a favourite technique of the Ottomans. Revnak-i Bostan also mentions the human factor as a remedy for ailing plants. Aleks reads from the book: two people approach a tree and one of them says, ‘I will cut down this tree.’ The other person says, ‘Insallahu tealla min ba’d yemiş verür' (‘Great lord, after some time it will give fruits’). The lesson here is simple: don’t be too axe- or bulldozer-happy, and let nature take its course. As the bostan where the workshop took place grows mostly vegetables and herbs, Aleks outlined some remedies for these too. One method is to soak the seeds of melon (kavun), squash (kabak) and cucumber (salatalık) in liquorice (meyankökü) and then spread them around the garden. To keep insects away, soak devil’s weed (Tribulus terrestris) in vinegar and then spread that around. 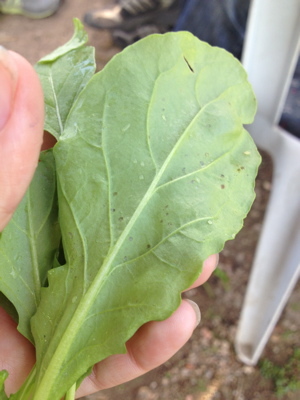 Marinating salt in water for a day and then sprinkling it around the garden protects also protects plants from insects. Planting mustard (hardal) around a garden can promote the health of crops in general. Another good tip is soaking the vegetable seed in a mixture of ox dung and water before planting (prevention is better than cure, after all) to protect it from insects. How many of these remedies were actually used in the Yedikule bostans historically, Aleks admits, is unknown. 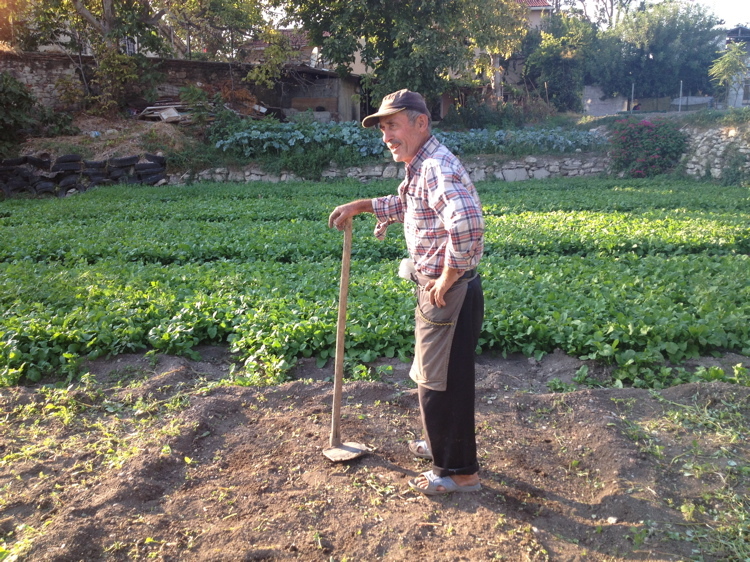 But there is one method for preserving seeds recommended in the Revnak-i Bostan that is being used today by Yedikule farmers – such as Ahmet, who comes from three generations of Yedikule gardeners. Vegetable seeds are wrapped up in a cloth with cow dung before planting to ensure that they grow into healthy, pest-resistant plants. After Aleks’ presentation and question time, we were taken around the bostan to see the various vegetable crops and the water-supply system. 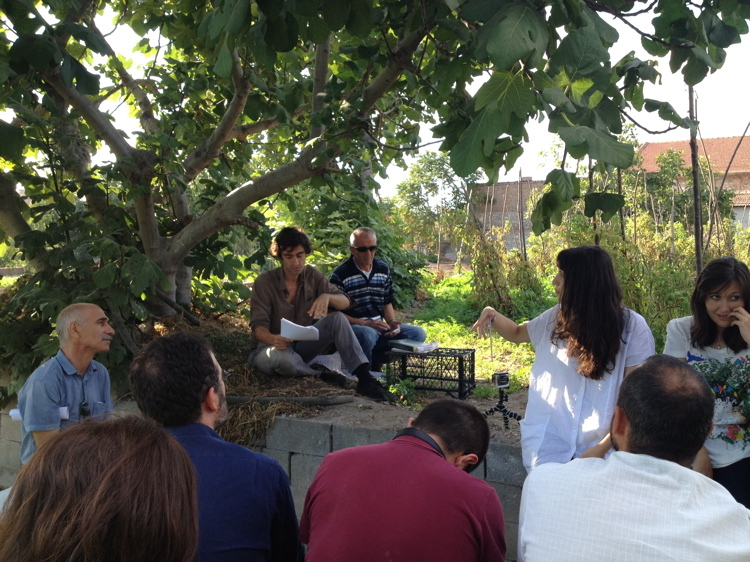 The workshop ended with one of the Yedikule bostans farmers, Mehmet, giving a short lesson in growing rocket (roka). Although it was in Turkish and my understanding was limited, watching as Mehmet delicately handled the rocket and hearing the emotion in his voice was enough to tug at my heartstrings. Some of us purchased bunches of rocket, as well as the other vegetables and herbs on offer. On my way home with a bag of tomatoes, rocket and mint, numerous people on the minibus and tram commented on the powerful smell of the mint. Indeed, the crops in these bostans are healthy and plentiful, and they smell and taste like no other. This blog ends, like all our others on the Yedikule bostans, by reaffirming that these gardens must be preserved. Of that there is no question.